And on a double word score, too! Some scientific studies suggest that forming words by using an assortment of random letters is beneficial because those mental exercises stimulate the… oh, you know — that thing where your memory… the brain, that’s it. One of the things I’ve noticed, though, is that people tend to repeatedly play the same few words, especially in the on-line versions. “Not” appears frequently, as does “ox”, and “time”. It seems to me that to really get the ol’ neurons in the brain firing, one needs to rummage through the vocabulary and come up with more unusual words. Obviously there is the limitation of which letters a player has drawn, but here are a few suggestions for more creative plays. If you’ve got enough space to lay this down, go for philtrum. Yes, it’s a real word — it’s the name of that vertical groove we all have on the upper lip, just below the nose. When you tell your opponents what the word means, watch their reaction — they won’t be able to keep from touching their philtrums. It’s like saying to someone, “Hey, what’s a goatee?” No one can describe it without stroking their chin and philtrum. Another good word is quay, which means a dock or wharf, and is usually pronounced “key”. This word has the virtue of allowing you to get rid of the letters “q” and “y” in the same play. Query is good for that, too. After you lay down tiles that spell louche, your competitors may look askance at you, but you can inform them that it means disreputable; shady. If you’re missing the letters “c” and “h”, you could play loupe, which is one of those little magnifying glasses that jewelers put in their eye socket. If you get stuck with the dreaded “z”, you might be able to play zeal, which Ambrose Bierce defined as, “A certain nervous disorder afflicting the young and inexperienced.” Other desperation plays with a “z” include brazier (a container for hot coals, not an undergarment), adz (a tool similar to an ax), zap, zig, and zoa, which as you’ll recall, is the plural of zoon. In the right place on the game board you can get a good score with vole, a rodent that resembles a mouse, only stockier. Vole can also be useful if you happen to be a songwriter, because it rhymes with mole, tadpole, foal, coal, and patrol. This assumes you’re writing Country music. Vole is no relation to vowel, and among the stressful moments in word games are those when you are chronically short of vowels. Don’t forget — sly doesn’t require one, nor does fly or dry. Oh, and pyx is in the dictionary; it’s what the box that contains the Eucharist is called. On the other hand, if you have a plethora of vowels, there’s aerie (the nest of an eagle or hawk), iguana, oboe, nausea, audio, and toupee. So that’s just some friendly advice to add variety to your word plays. I know how stressful those games can be, and my intention is not to perplex, but to give succor (help; relief; aid). 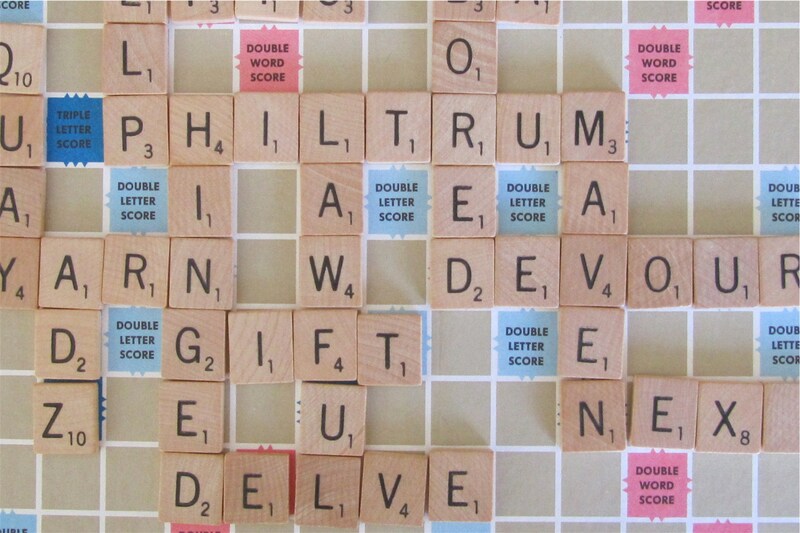 This entry was posted in Language and Literature and tagged philtrum, Scrabble, word games. Bookmark the permalink. I don’t know why, but all my favourite words seem to pop up in P.G. Wodehouse eventually. To name but three: Poltroon, Jejune, and Concatenation. Try them on your friends. Vim is a good Scrabble word that appears in a Wodehouse book I browsed a moment ago; I also found blighter, bloke, and porringer. As you probably know, Luke (but some of us didn’t), a porringer is a sort of soup bowl that has a handle. Succor is one of my favorite words; I always feel as if I am reading Dickens when that word appears. After slogging through all of those 18th and 19th century hymns, Bierce’s definition of zeal is hilarious and wonderful.